From Zen Monkey Studios. Before Aang, there was Roku, the Avatar from the Fire Nation. He shares his wisdom with Aang from the Spirit World. 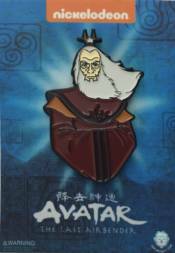 From Avatar the Last Airbender comes this soft enamel pin that measures an estimated 1.75 inches in height.